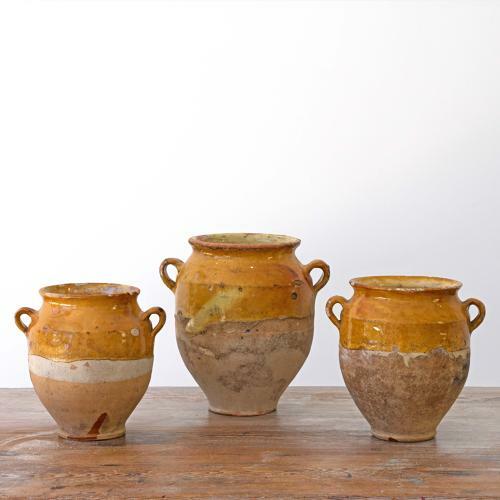 A beautiful collection of rare caramel glazed terracotta confit pots from L'Aude in the South of France. Turned upside down in the kiln during the firing process, caramel drips rain down the sides. The bottom halves were purposely left unglazed as these pots were half buried in the ground to help keep the preserved contents cool. The rich caramel glaze of these pots sets them apart from their more commonly found yellow glazed cousins. Available individually, or as a set of three. French circa 1850.